The home comprises of 2 floors with a passenger lift. All our rooms are individually designed and we welcome residents personalising their accommodation should they wish to do so. 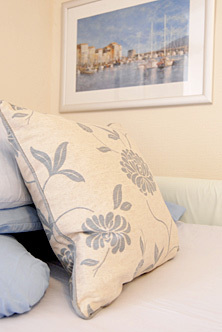 Over both floors we have a selection of single and companion rooms for married couples or for those who wish to share. Some bedrooms have en suite amenities all our bedrooms have washing facilities. On the ground floor we have 2 communal lounges and a large dining room. The main lounge leads onto an outside seating area. At the rear of the building we have a walled garden with additional seating.